The one hundredth liberal Filipino politician has recently successfully attended the leadership training at the “International Academy for Leadership” (IAF) of the Friedrich-Naumann-Foundation in Germany. Undersecretary Nestor C. Ponce, Jr., who is the Presidential Technical Assistant for Resettlement and a former Congressman for the Liberal Party of the Philippines, returned to Manila after attending a one-week-training course entitled “Political Strategies: Fighting Fundamentalism”. 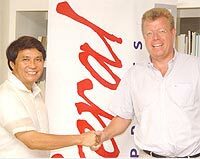 Next in line to travel upon the invitation of the Friedrich-Naumann-Foundation are two local government officials associated with the Liberal Party of the Philippines. City Administrator of Manila Col. Ernesto G. Dionisio and Board Member David C. Suarez (Quezon Province) will travel to Gummersbach for a one-week workshop entitled, “Local Government and Civil Society”. The basic idea behind these leadership trainings in Germany is to bring liberally minded political leaders from all parts of the world together and provide a forum for the deliberation of liberal solutions to the challenges of our societies. “These international programs are a useful addition to our local activities as they give young Filipino politicians the opportunity to expand their horizons and network with like-minded people from different parts of the world”, says Dr. Ronald Meinardus, the Resident Representative of the Friedrich-Naumann-Foundation in the Philippines. The IAF-participants have formed an alumni group that holds bi-monthly meetings in Makati City to discuss timely issues of concern to liberals. For an overview of the IAF-programs and reports of the Filipino participants which highlight their experiences in Germany, please visit IAF Pogram.